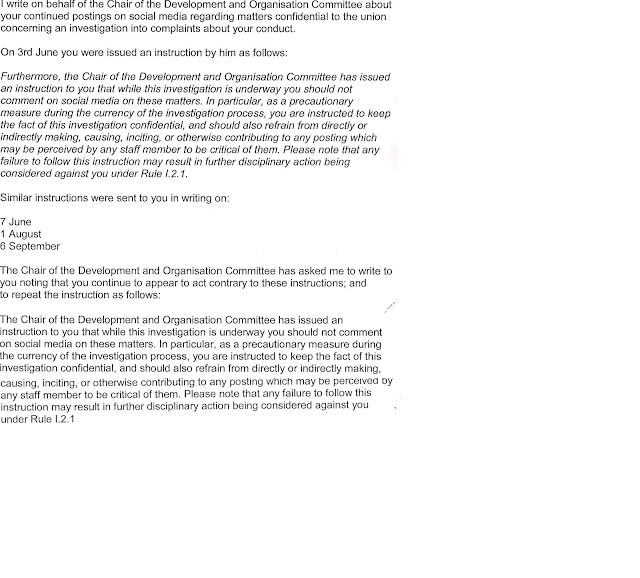 Can I just point out that someone is reading this blog and then reporting what I post to UNISON, thereby getting me into further trouble? Honestly, I thought I could rely upon the regular readers of this blog (Sid and Doris anarcho-Trotskyist) not to go blabbing. Please keep this to yourself now! It is good – if predictable – news that the socialist leader of the Labour Party has been re-elected with increased support in spite of the best efforts of much of the Parliamentary Labour Party, the media and the establishment to undermine him. He is even more fortunate in having been offered the advice of our General Secretary about what to do next. It seems the key is to unite “using the talents of the best MPs from across the party in the shadow cabinet” (although the calibre of the shadow cabinet does seem to have improved in the past three months). What UNISON members – and all trade unionists – need right now is a Labour opposition that really opposes the Tories, not just in the Palace of Westminster (although that is not unimportant) but also using every elected position we can gain and also in the streets of every community. We need this because our power in the workplace is at its least in a long time. Strike action is at its lowest level since records began and we have failed to prevent the passage into law of those elements of the Trade Union Act which are most damaging to our ability to reverse this decline in our power. This lack of workplace power accounts for our failure to defend our living standards. Therefore we are reduced to organising a campaign to get the public to congratulate our members on their good work, whilst the living standards of workers in local government and the health service are in free fall. Our members can feel good about being appreciated as they shop carefully in Lidl and Aldi since we failed to smash the pay freeze. Workers having been disarmed in the workplace, thanks in large part to a trade union movement the leadership of which clearly has no intention of contesting the anti-union laws, we desperately need the political wing of our movement to find a way to pursue our interests. We can ourselves help. I will blog further in due course about today’s meeting of the Development and Organisation (D&O) Committee of the UNISON National Executive Council (NEC) but will mention now briefly the excellent presentation which the Committee received upon UNISON’s development of our digital/online presence. I particularly commend the advice from the Union on how to ensure more members read your bulk emails. Apparently you have about three seconds to capture the attention of a reader online if you want to communicate anything effectively. I shall not follow that advice on this blog however, since I am not writing this for you but primarily for my own amusement (which is the most important objective for anyone with the slightest modicum of self-regard). If you don’t want to read what I have to say then you have an entire internet to amuse yourself with. Today’s Committee meeting contributed significantly to my amusement for the number of occasions on which colleagues made jokes about the dangers of “unofficial blogs” or social media generally. It wasn’t until I lunched (not wisely but too well) with a couple of comrades that it was pointed out to me that these comments may have been intended to have been directed at my good self. 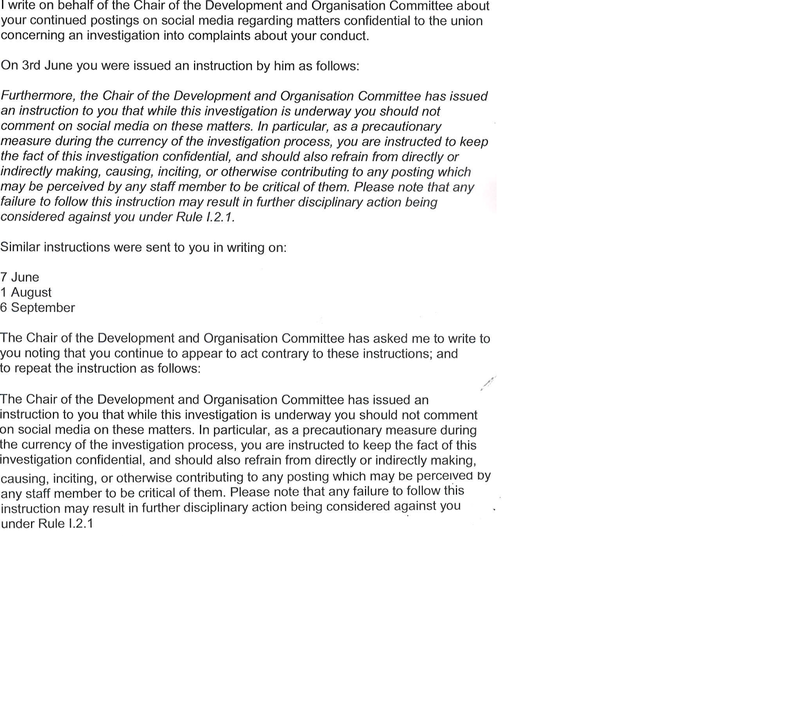 Given that the third of three disciplinary investigations which UNISON has initiated against me concerns my failure to keep confidential the previous two disciplinary investigations (so please don’t mention this to anyone) I was tickled that colleagues felt no need to observe any such injunction themselves. Which is fine by me, since the risible allegations which have led to the unnecessary investigations into your humble blogger are indeed a source of amusement. For those who may fear that I am under attack by the “UNISON bureaucracy” (and/or their lay hangers-on) I can assure you that I am fully prepared to be savaged by a dead sheep. I shall leave it to any intelligent readers to work out for themselves the motivation for attacks upon a trade unionist compelled to complain to the Certification Officer (and to contemplate the risks). Oppositions cannot win General Elections in the UK - so can we focus on what the Labour Party can do for working people now please? Of all the (great deal) of idiocy which has surrounded the avoidable strife of the Labour leadership election (enabling the Conservative Government to get away without having any plan to deal with the disastrous outcome of the Referendum) perhaps the most stupid claims of the right-wing are that Jeremy Corbyn cannot lead Labour to victory in a General Election. If you look back at the last four changes of Government in the United Kingdom (the only ones which I remember) then you see how true it is that Oppositions do not win General Elections, Governments lose them. (I exclude the change from a Coalition to a Majority Conservative Government in 2015 because that wasn’t really a change of Government). In 2010 Labour lost power because of the economic crash which had begun two years earlier. In the short run the electorate punished a Government for being in charge when the economy crashed (and in the long run the material basis for the “New Labour” compromise between economic liberalism and social progress had been destroyed). In 1997 Tony Blair won an election (in which John Smith would also have triumphed) because John Major’s Government never recovered from the economic consequences of sterling crashing out of the Exchange Rate Mechanism. This smashed the Conservative’s reputation for economic competency, but also had negative impacts for which the electorate punished the incumbent Government as soon as they had the opportunity. In 1979 Jim Callaghan lost to Margaret Thatcher not because there was any popular movement in support of the policies with which she was to come to be associated (many of which she did not then yet advocate) but because the voters punished the Government for the winter of discontent, and for the economic malaise of which it was a symptom. In 1974 Ted Heath lost to Harold Wilson (albeit in two stages) because voters lacked confidence in the ability of the Tories to address the economic and industrial relations problems which had been expressed by the need for a three day week to deal with power shortages. The most that an Opposition Party aiming to be a Government can hope to do in the run up to a General Election is to prepare and campaign as effectively as possible – but if circumstances on election day do not dictate that sufficient voters feel badly off under the present Government and see no immediate hope of improvement from the status quo then the Government are likely to remain in office. The most important question confronting the Labour Party is not whether the Party can form a Government in 2020 (which, given the gerrymandering of constituencies and the loss of Scottish support, seems a remote possibility under any Leader). The most important question is whether there is a future for a Party of the Left to represent the interests of working class people, or whether Labour is doomed to decline as other parties of European social democracy are in decline. With the trade union movement in the doldrums (and strike action at a historic low) the labour movement needs a political wing in order to be part of our fight, right now, to promote the interests of working class people. Once Jeremy Corbyn is elected (again) perhaps comrades in the Labour Party could return their attention to the real world? As I have observed here before union activists could usefully engage with the Party’s Workplace 2020 consultation in order to try to be heard. Union mergers and industrial logic.